Summer’s here and the kids are on school holidays. Today I took a day off work and took my son to a nearby water park. We see this every time I drive to work. The highway on-ramp circles the mega-complex. While I enjoy a beach, I spent my childhood immersed in chlorinated water. I have a large lung capacity (just ask my partner) Being underwater, swimming lazily, and testing the limits of one breath is the closest I know to dreaming while wide awake. 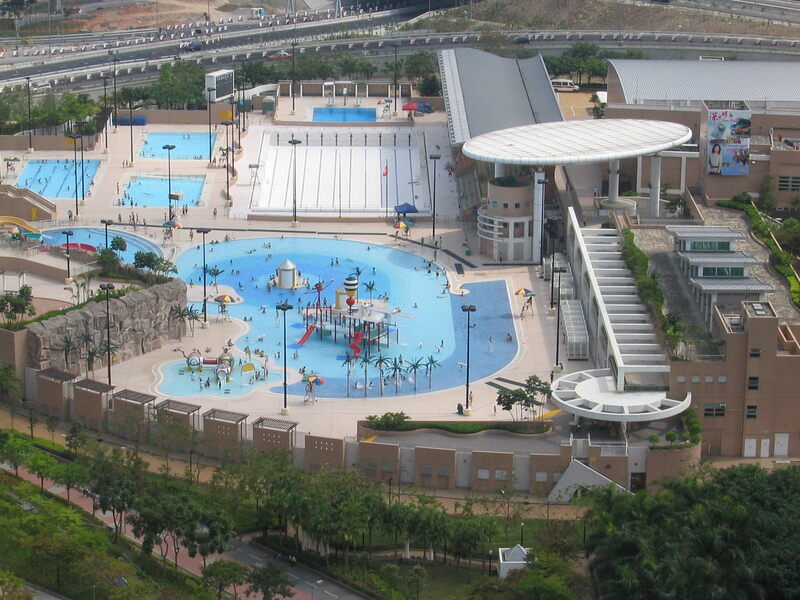 Now while I say “Water Park” – and all the expense and mayhem that normally entails – this is actually a public pool complex run by the Hong Kong Government (Go Public Service!). What marvelled me was the thought put into the constructions, maintenance and operation. Entry is HK$17 for adults and $8 for children (roughly US$2 and $1 respectively). You can use your stored value Octopus card at the turnstile or an available coin machine gives you the change required. The only way into the pools themselves is through a three metre wide archway fitted with dozens of shower heads and a shallow trough of water. In a city once afflicted by SARS, Hong Kong is now obsessed with cleanliness. It’s great. Free rental lockers and a massive, clean changing room mean you abandon all but your swimsuit and goggles. It’s oddly liberating – and nice to be at a pool complex free of duffel bags, wet towels, food wrappers and more. We headed straight for the play area. There an over-sized bucket fills with water then tips onto swimmers every four minutes. It was a deluge! There were water cannons and slides and hoses and sprays everywhere. My 8-year-old Ethan and his friends Lulu and Nick were in heaven. I admit I had a run in my step as we bolted from play station t play station! After we hit the water slides. There are two stations – one a mid-sized slide and the other higher still. Attendants buzzed open turnstiles so one swimmer at a time could enter then slide. Only when the way was clear could the next enter. As a parent, I have to admire the safety and the visible presence of lifeguards and first aid officers. The lifeguards were actively ensuring children cleared the pool at the bottom of the slides but didn’t interrupt mild horseplay in another pool. It was fun and safe! Another pool has three diving boards (and a dedicated lifeguard). I can’t recall the depth of that pool but can say it took a concerted effort and sore ears to finally reach the bottom. A large 50 metre Olympic pool was dedicated to lap swimmers. Smaller pools were available for children’s lessons. Adjacent to the water bucket pool was another pool with baby-sized slides and water cannons shaped like frogs and bees. The size of the complex and the proximity to enormous housing estates warns me the centre is probably packed on weekends and during school holidays. Today felt like we were in Disneyworld alone. Great fun! No lines! On the MTR, take the Tseung Kwan O line to Po Lam. Exit into the Metro City Plaza and then walk to the exits at the cinema. Turn left and walk two blocks. There will be a sign directing you to the sports centre (the pool is part of a large complex including squash courts, basketball courts, fitness centre and the local public library). Allow 5-10 minutes for the walk. By taxi from Central allow 25 minutes and HK$180 each way. No idea how to say Sports Centre in Cantonese! By take the Eastern Harbour Crossing then the Tseung Kwan O Tunnel through the mountain. Stay on the highway to the exit for Po Lam and Hang Hau. Turn left at the round-about and follow the signs for the sports centre. Limited parking is available on-site for HK$7 per hour. The park has three daily shifts, ensuring the entire centre is empty for cleaning and crowd control. It is open from 6:30 am to 12:00 noon, then from 1:00 pm to 6:30, and finally from 7:30 to 10:00 pm. Swimmers are asked to exit the pools 30 minutes before scheduled closings. It is closed every Monday for “a complete sterilisation” according to signs.